First off, thank you so much to everyone who entered the giveaway! The winner is....Sheree Hartung! Laura has contacted you! Congrats!! I cant wait to talk with you all more and I am definitely doing another giveaway soon so stay tuned! So I honestly don't have much to recap from my weekend, it really wasn't the best. There was good and bad moments but it was very busy and has left me in somewhat of a funk. Ugh hoping a run will pull me out of it- well see. 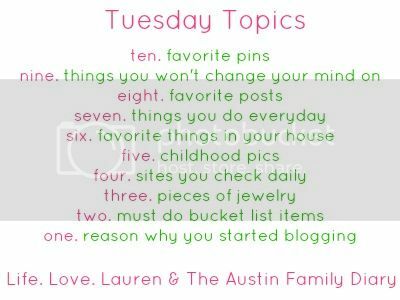 In lieu of a weekend post, I'm linking up with Austin Family Diary for Tuesday topics for my 6 favorite things in my house! 1. Our tv. That sounds bad, we don't even use it that much but the husband bought one before he moved in here and it is one of the fancy new 3d smart TVs. It's just really fun to have to watch movies on. Our favorites are the 3d Disney Pixar ones. 2. My framed photos. 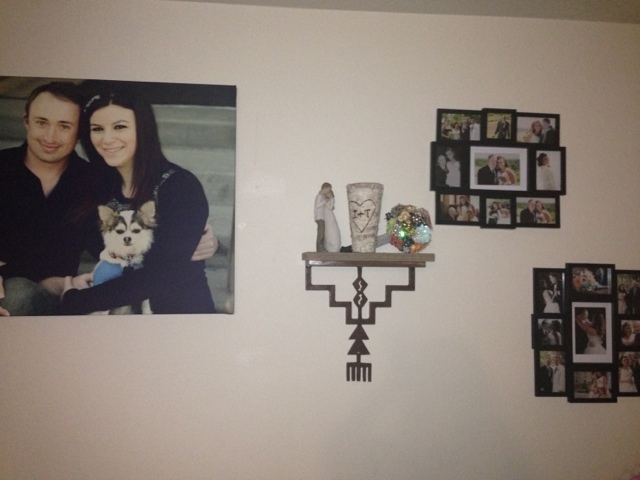 They are all pretty much contained to the living room since the walls are white the photos really liven them up. I have a huge canvas print of me, the husband and our dog, as well as a canvas of me and my grandpa. We also have several sets of frames with wedding and other favorite photos. I'm very sentimental so this means a lot to me. 3. Going off of the sentimental thing, I would also have to say that I have a box of sentiments that is also pretty close to my heart. It has photos and heirloom jewelry pieces from my dad and mom. I also saved many memories from my husband and my relationship from start to now. Letters and gifts from our relationship. Eventually it would be cool to do a post just on the items in this box. 5. My blankets. I love a good soft cuddly blanket. I used to try and collect them, I am kind of laying off that but I really could ask for a new one each Christmas and be thrilled. Maybe I will get back into it. Again, i need places to put them. Costco seems to always have my favorite ones. I love being cold and curling up with my dog and a soft blanket. 6. I guess I would have to say the bathtub. It's crappy and it's tiny and I hate it but I love baths so much that it is still one of my favorite items based on the fact that I use it daily and a lot of apartments don't have them at all. Kitchen and bathroom are my top 2 things for a house. I can't wait to have a separate bath that I don't have to share. Someday someday, our lease ends in November so hopefully by then we have the means to rent a house. The tub I have now is good though, my husband organized it for me so that's awesome I have all my fav products and magazines right there. Phew okay, there are my top house items. 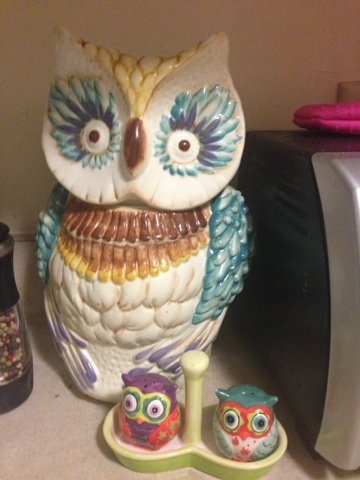 Sorry about the lack of photos- my house is a disaster area!! I have a couple ideas for posts later this week so I will try to post after work tomorrow! Have a great day!! How was everyones weekend? What are your favorite house items? Pictures are the best! Thanks for linking up! !